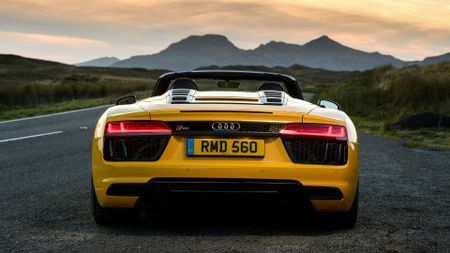 With the exception of the Porsche 911, no other model fits the ‘everyday supercar’ archetype quite like the Audi R8. 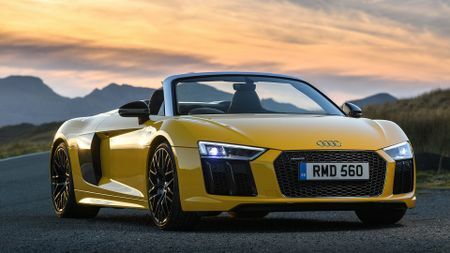 The R8 Spyder steadfastly maintains the coupe’s blend of exotic performance and everyday usability, but adds more visual and aural drama with very little dynamic compromise. Given the choice, we’d opt for the Spyder version every time. The al fresco version of the Audi R8 Coupé supercar and the first model to launch under the newly-christened Audi Sport department (Audi Quattro GmbH was renamed Audi Sport at last month’s Paris Motor Show). 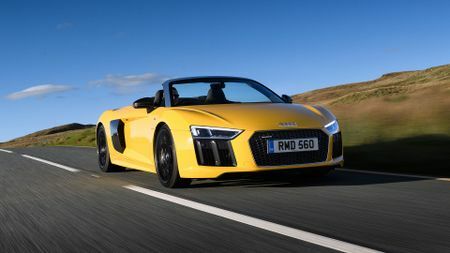 The R8 Spyder features the same four-wheel drivetrain and seven-speed dual clutch automatic transmission as its coupé sibling, but has undergone significant body strengthening to compensate for the loss of rigidity that’s created when you chop off any car’s roof. The showpiece remains a naturally aspirated 5.2-litre V10 that lives beneath a louvred carbonfibre cover and develops 533bhp at 7800rpm – 69bhp shy of the hyper-styled, mechanically similar and fiscally punchier Lamborghini Huracán Spyder. The three-layer fabric roof is available in three colours – black, brown and red – and is able to unfurl in 20 seconds at speeds up to 31mph. It benefits from a retractable rear glass window that can be operated independently. Standard equipment includes leather seats, electrically adjustable heated seats, sat-nav, DAB radio, Bluetooth, front and rear parking sensors, climate control and a 12.3-inch digital screen that Audi calls its ‘virtual cockpit’. This replaces the traditional dials you’d normally find in your instrument binnacle with a screen that can be customised to display a variation of speedometer, tachometer, navigation, radio, phone and fuel settings. Very flattering. 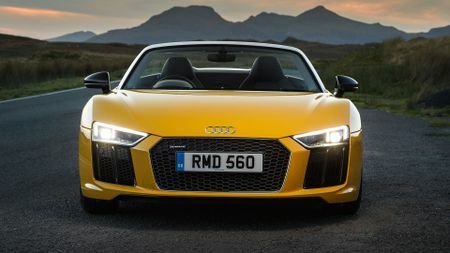 You’d think any 500+bhp supercar should be a handful to drive, but the Audi R8 Spyder isn’t any more intimidating than our long-term Audi TT S Roadster. 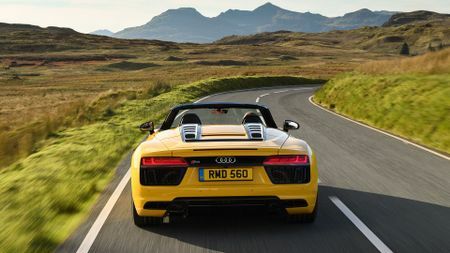 Progress is so quick and so effortless in the R8 that the 0-62mph sprint is consistently dispatched in 3.6 seconds, with the official top speed of 197mph feeling entirely accessible. Alternatively, you can engage fully automatic mode and the car will happily crawl though dense traffic for hours without lurching, screeching or overheating. For some supercar owners, this may sound like witchcraft. It’s difficult to detect the additional 125kg in bulk over the Coupé, too. In the corners and under heavy braking, the Spyder feels benign and stable while offering immense traction. The steering offers very little in the way of feel, but the car responds immediately to your inputs. 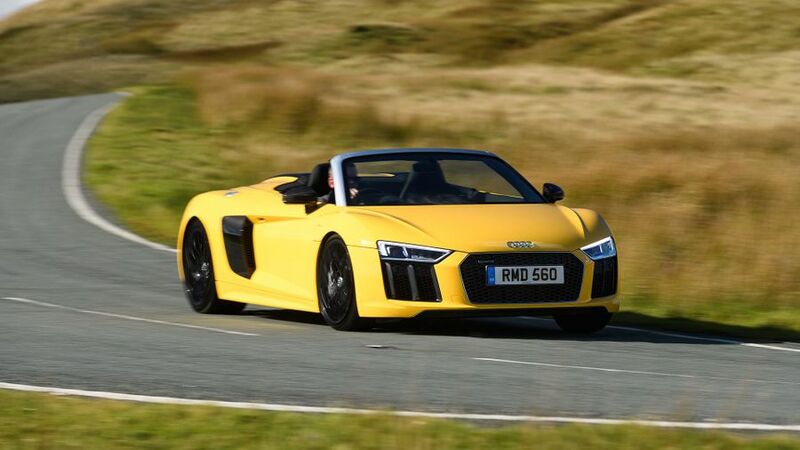 Yet the greatest thing about progress in the R8 Spyder is the accompanying soundtrack. There is no doubt in my mind that a naturally aspirated V10 offers a much greater timbre and more vocal range than any of its turbocharged or supercharged rivals, Jaguar F-Type SVR included. And when the roof is down, there is far less buffeting and wind noise than you would get from cruising in a Porsche 911 Cabriolet. Be warned, though, that V10 also offers up a pretty woeful 24.1mpg, even with Audi’s ‘cylinder-on-demand’ technology that can effectively shut down half of the engine when it isn’t under stress. If you’re looking for a genuine everyday supercar that can offer accessible dynamics yet still cause onlookers to get their camera phones out, then yes. 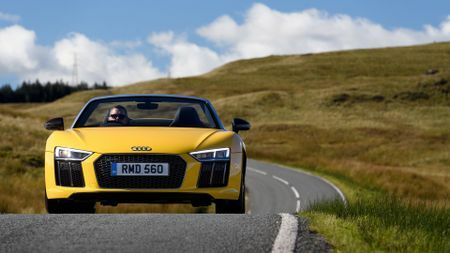 The Audi R8 Spyder may not be the most involving supercar to drive, but it is one of the easiest to live with, allowing you to be both emotionally and financially committed. Lacks the Spyder’s visual drama but with an identical 533bhp, it’s half a second quicker to 62mph and benefits from two extra chairs. Cheaper to buy and run, but the 567bhp supercharged Jaguar lacks the dynamic polish of the R8. New roadster version of the AMG GT sports car boasts 549bhp. Promises muscle car performance when it arrives in early 2017.